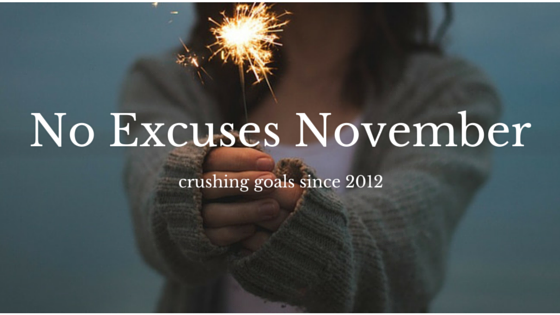 No Excuses November – What can you do in a month without excuses? No Excuses November is a community of ambitious and excellent individuals who have committed to a goal to accomplish during the month of November. Do you have what it takes to take the challenge? I thought you might. In November 2012, as a way to challenge myself (Allison Baker) and a few writer friends, I decided to make a commitment to write 1,000 words a day for 30 days. I decided to shout this commitment from the rooftops (ok, Facebook) for accountability, and received an influx of emails. These emails were from other friends, family members, and strangers who wanted to make a commitment too. But not everyone wanted to make the same commitment as me. Some wanted to lose weight, while others wanted to update their resumes or organize their homes. It appeared that everyone had something in mind they wanted to accomplish. I began collecting email addresses so I could send encouragement to them via email and within the first few days of November, over 70 people had joined the group! Suddenly, No Excuses November wasn’t just about my goals anymore. Over the course of the month, No Excuses November became a creature of its own. Although I was the one sending out “Pep Talks” to the group, it was the group that inspired me to follow through with my goal. Just take a look at our Facebook Group, and you’ll see what I mean. Last November, the No Excuses November group came together to cheer each other on and help each other accomplish their goals. And this year, I’m extending the invitation to YOU! You can think of me as the Head Cheerleader of the group, but this group wouldn’t exist without the NoExNo community. You can expect a few Pep Talks from me, but I will be recruiting others to be cheerleaders as well. Last year, some of the best contributions came from others in the group. This came in the form of guest Pep Talks, Facebook posts, photographs, or creative graphics. It’s inspiring to see other people’s progress, and it’s comforting to know about other people’s struggles. That’s what makes NoExNo so great! To participate, all you have to do is make a commitment, and try to stick with it. The truth is, not everyone will achieve what they set out to do. And that’s okay. The point is that you have recognized something you want to work on, and you had the guts to do something about it (even if only for the brief moment it took to enter your email address). Let’s see what we can accomplish this month! I think you’ll surprise yourself. Here is the No Excuses November blog, which will be updated frequently.